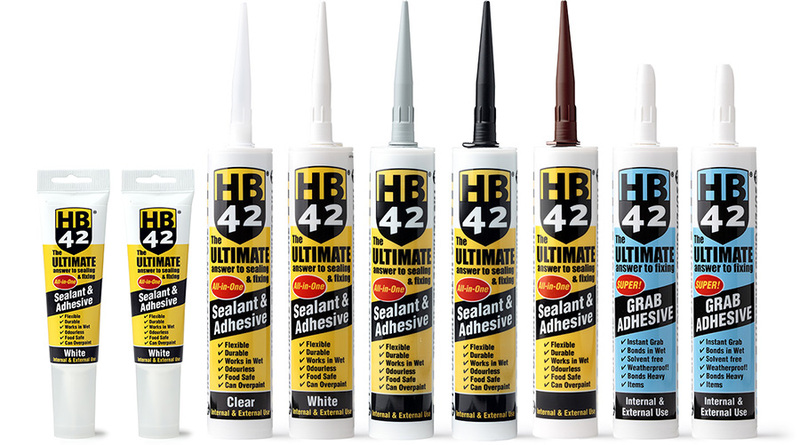 HB42 ‘All-in-One’ Sealant & Adhesive Seals, Sticks & Fills. Based on the new generation of advanced hybrid polymer technology for outstanding adhesion and strength. 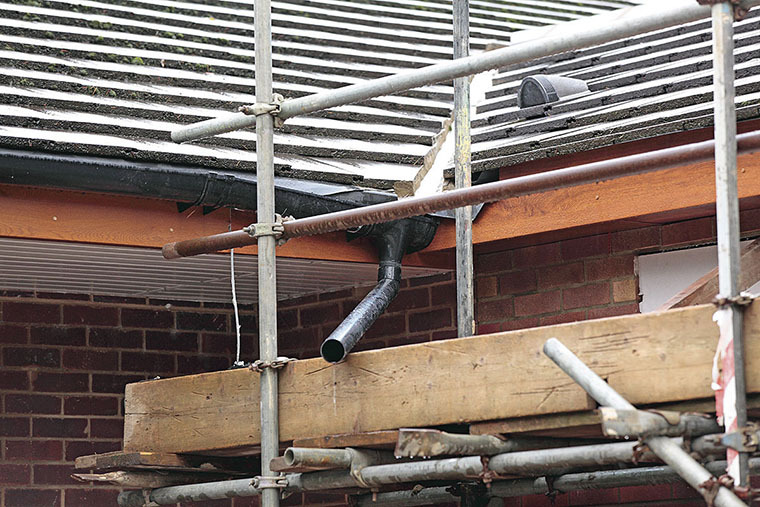 HB42 can be used inside and outdoors, from sealing bathrooms to guttering. Unlike other sealants and adhesives, HB42 is odourless, food safe and has been GEV approved, recognised for its very low emissions. 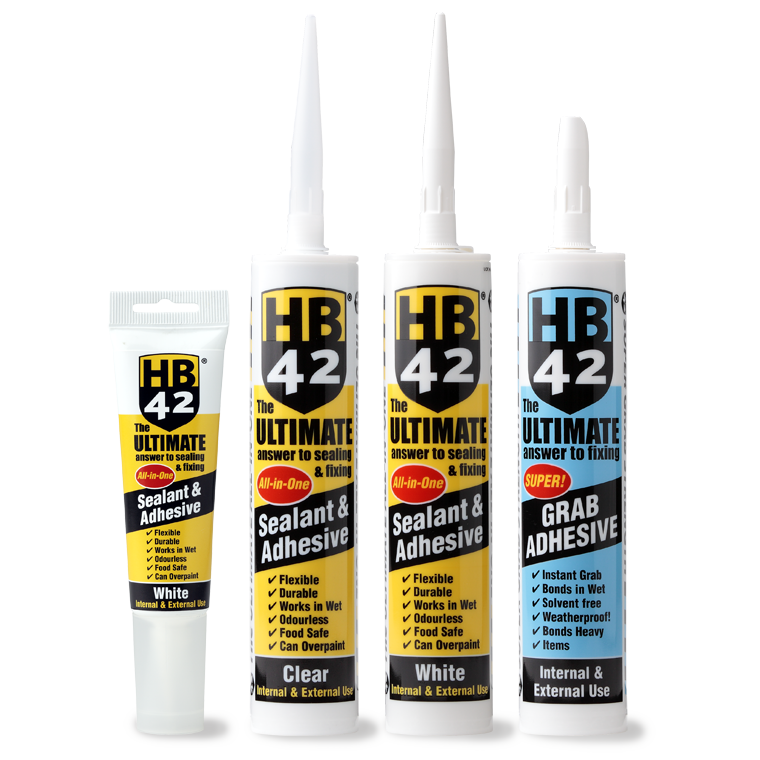 HB42 ‘Super’ Grab The Ultimate answer to fixing has an initial bond strength double that of most other grab adhesives, will bond to most substrates and will even bond in the wet. 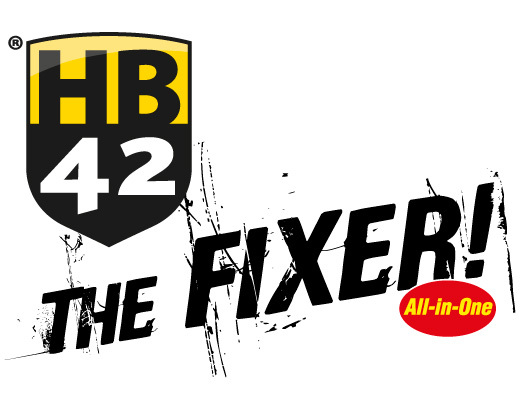 HB42 ’All-in-One’ Sealant & Adhesive is the ultimate answer to sealing, fixing and filling. A “one-tube-does-all” product, designed to meet the complex demands of the construction industry. 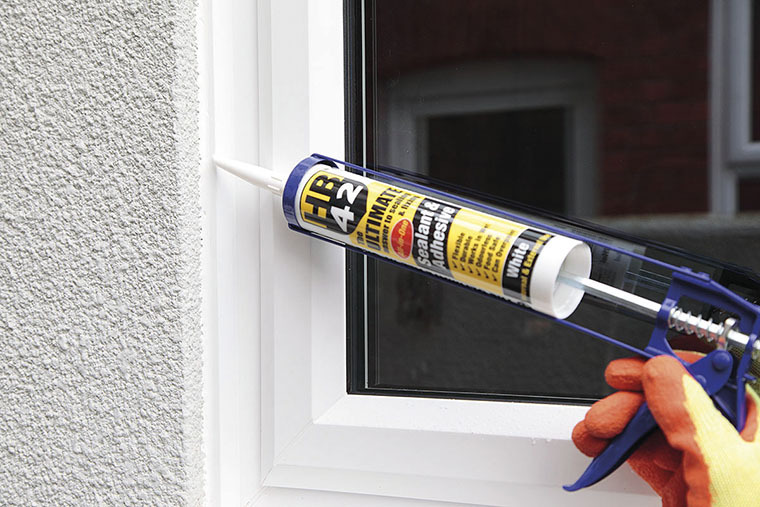 Based on advanced hybrid polymer technology, this trade strength sealant and adhesive offers outstanding performance across a wide range of industrial applications, including adhesion to glass, wood, stainless steel, aluminium, porcelain, UPVC, coated metal and polystyrene. HB42 can be used inside and outdoors, in the wet or dry! Odourless, food safe and recognised for its very low emissions, HB42 is one of the safest all-in-one sealants on the market. The HB42 ‘All-in-One’ Sealant & Adhesive now comes in a very handy 80ml ‘Squeezy’ tube. Based on advanced hybrid polymer technology. 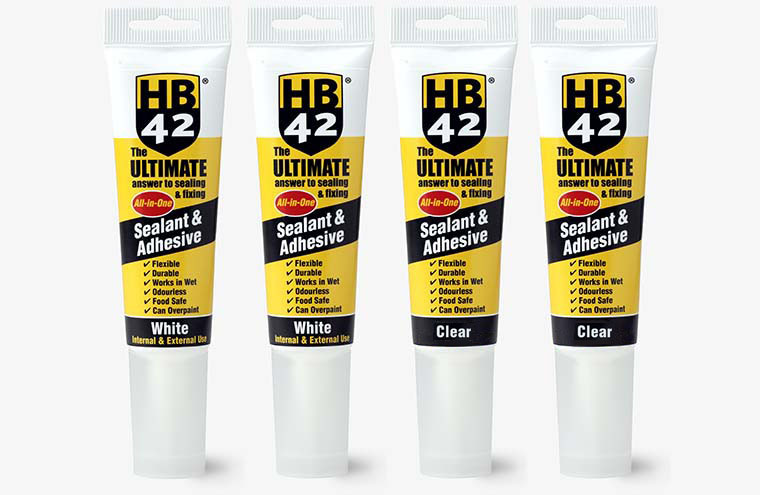 HB42 seals, sticks and fills delivering outstanding adhesion and strength. HB42 can be used inside and outdoors, from sealing bathrooms to guttering; bonding in the wet and even under water! The Ultimate answer to fixing… is based on instant grab technology, a trade strength adhesive that will even bond in the wet, adhere to glass, wood, enamel, painted surfaces, plasterboard, coated metals, Perspex, concrete, plastics, PVCu, stainless steel and many more! For fixing large panels, wall boards, windowsills, dado rails, and bonding brick slips, claddings and sanitary fixtures – a complete, all purpose, fixing solution designed to eliminate the need for secondary support. Unlike other sealants and adhesives, HB42 is odourless, food safe and has been GEV approved with its very low emission levels. HB42 is able to bond to almost anything, including lead. Recommended for use inside and outdoors, it works in wet conditions and even bonds underwater! 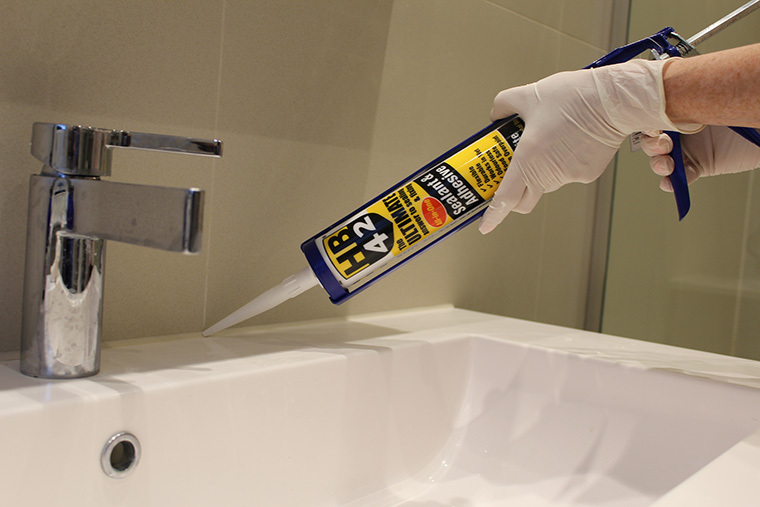 HB42 ‘All-in-One’ Sealant & Adhesive is multi-purpose: perfect for sealing joints around sanitary fixtures, windows and doors and can be easily over-painted. It can also be used for weatherproofing joints and fixing skirting, panels, windows, thresholds, and insulated materials. Go over to our Ask Pete? page to get advice and tips, and to see the many uses of HB42.